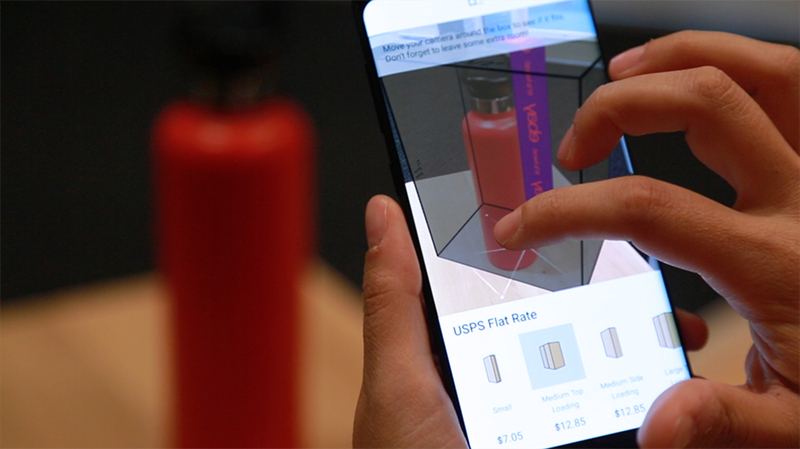 After scanning any object on a flat surface, the AR app will help you choose which USPS shipping box the object will fit in. Most augmented reality activations, especially for smartphones, are consumer-facing; a company is creating a gee-whiz entertaining or educational moment for an audience. But a good part of the potential of AR is practical, using a camera and a computing device to transform the perception of space into a different kind of usable information. And for a company like eBay, the line between a consumer and a producer has never been very firm. Amateurs are proprietors, too. That’s how you get something like Which Box?, a new AR feature inside eBay’s Android app. It’s a simple AR application that does exactly what it sounds like. After scanning any object on a flat surface, it will help you pick and choose which USPS flat rate shipping box the object will fit in, including visualizing the object inside the box. Sellers can remove trial and error from their shipping choices and get a solid estimate on how much a given package will cost to ship. “By coupling Google’s ARCore platform with premiere AR technology built at eBay, we are continuing to make the selling experience more seamless,” said James Meeks, eBay’s head of mobile, in a statement. According to eBay, the app was conceptualized by two different teams during the company’s Hack Week, then built in partnership with Google. A spokesperson for eBay said that support for iOS and ARKit is planned and will be released when the user experience and performance is operating at a satisfactory level, at a date to be determined. According to Statista.com, AR is on the rise. The economic impact of VR/AR is forecast to range between $5.8 billion and $29.5 billion in 2020. But the question remains: Will eBay even use an AR function—and if so, how often? A boxing visualizer is a nice thing to have, especially for irregularly and unusually shaped items, but in most cases, it may end up more gee-whiz than a serious tool for sellers.